After the previous week’s dismissal of Csaba Laszlo, his assistant manager Laurie Ellis took over as caretaker manager of Dundee United for the second time. However, unlike in his previous spell he could not engineer a win as United lost 2-0 to Championship leaders Ayr United at Somerset Park. Given that Dundee United had lost 5-1 in their previous game, Ellis was always likely to make changes for this game, and he duly did. There were five changes to the starting line up from the heavy defeat against Ross County, with Ben Siegrist, Callum Booth, Fraser Fyvie, Billy King and Matty Smith replacing Matej Rakovan, Jamie Robson, Fraser Aird, Yannick Loemba and Craig Curran. Sam Stanton and Nicky Clark were both fit enough for a place on the bench as they returned from injury. Former Dundee United manager Ian McCall had taken Ayr United to the top of the Championship playing some wonderful football, with the main goal threat coming from Lawrence Shankland, and given their great form it was the toughest possible game for Laurie Ellis to take charge of. It was no surprise to see the Honest Men start the game on the front foot, and they fashioned their first chance after a couple of minutes. Andy Murdoch found Alan Forrest at the halfway line. The winger drove towards the Dundee United penalty area before slipping the ball through to Lawrence Shankland. The striker tried to pass the ball top the unmarked Andy Geggan, but the pass was underhit and was cut out and cleared. Shankland had another chance in the 10th minute after Alan Forrest’s cross found him unmarked at the back post, and considering the form he was in it was a surprise that he did not convert the chance, but he took too long to get his shot away and the Dundee United defence were able to block his shot and clear the ball. The away side had their first chance a minute later when a lofted ball forward by Rachid Bouhenna was knocked down by Pavol Safranko into the path of Paul McMullan. In turn, he passed the ball wide to Billy King who hit a shot that Ayr goalkeeper Ross Doohan did well to block at his right-hand post. The home side continued to have the better of things, and on eighteen minutes Christophe Rabitsch did well to charge down a goalbound 25 yard drive from Mark Kerr. That was only to be a stay of execution, as on the 21st minute the home side took the lead. Michael Moffat split the Dundee United defence with a wonderful through ball for Lawrence Shankland, and the in-form striker made no mistake by sliding the ball past Ben Siegrist from 15 yards out for what was already his 18th goal of the season. Ayr continued to be the better side after their goal and after 29 minutes had a great chance to double their lead after Moffat broke clear down the right hand side and made his way into the penalty area. Rachid Bouhenna and Paul Watson pursued the Ayr striker to try and get in front of the ball. It was in vain as Moffat did manage to get a shot away with his left foot, but luckily for the away side it flew over the bar. Ayr nearly allowed the away side back into the game soon afterwards. An attempted clearance by Jamie Adams smacked off his team mate Liam Smith and into the path of Pavol Safranko. The Slovakian striker threaded the ball through to Paul McMullan, and home defender Daniel Harvie slid in on McMullan to block his progress, but he could only handle the ball as he did so, conceding a free kick and earning himself a booking. From the free kick, Fraser Fyvie smashed the ball into the Ayr wall. The ball broke to Rachid Bouhenna, who played the ball wide where Paul McMullan got to the ball just before home defender Liam Smith. McMullan slid the ball into the six yard box where Matty Smith flicked the ball towards goal, only for Ross Doohan to make a great reaction save to his right. Dundee United were coming more into the game as the first half drew towards its close, and with six minutes left of the half some good link-up play between Paul McMullan and Pavol Safranko saw the striker turn his man and play the ball to the onrushing Christophe Rabitsch, but the Austrian midfielder could only hit the side netting with his effort on goal. That was the end of the chances of a breathless first half with two evenly matched sides split by one moment of quality. Dundee United started the second half well as they sought to get back into the game. They forced several corners at the beginning of the half, and although from one of those corners Ross Doohan was forced into a save from a Matty Smith glancing header, the away side did not get the equaliser they were pressing for. The half continued at a ferocious pace, with both sides committing men forward at every opportunity. 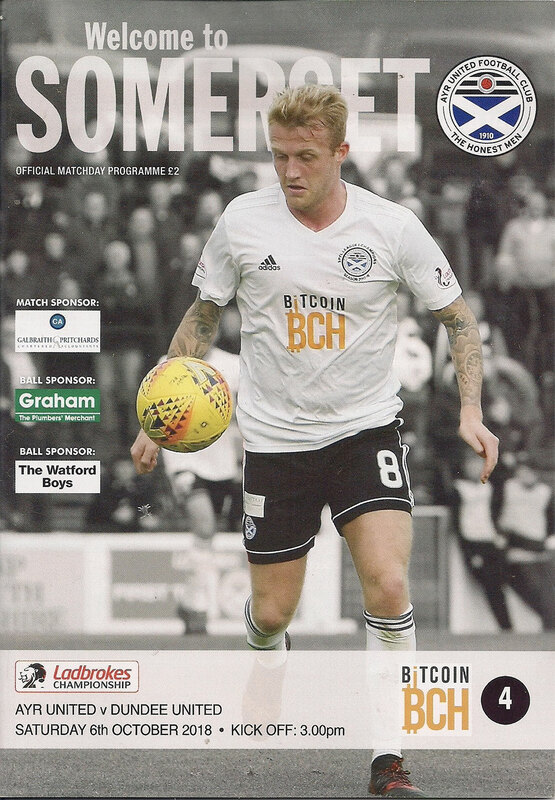 Five minutes into the half, Ben Siegrist was called into action again when Lawrence Shankland was played through on goal after a one-two with Michael Moffat, and Siegrist had to smother the ball at the Ayr striker’s feet before he could get his shot away. The away side broke up the park and forced another corner, and this time Ross Doohan saved from a Frederic Frans header. Two minutes later, Fraser Fyvie hit a dipping volley from outside the area just past the post, and within 60 seconds Pavol Safranko was inches away from getting on the end of a through ball from Rachid Bouhenna, however Jamie Adams got to the ball just before the Slovakian striker and the danger was cleared. Midway through the half, the home side had a great chance to double their lead after substitute Declan McDaid was played in on goal by a poor pass from Fraser Fyvie. However, he looked unsure whether to shoot or pass, and in the end his attempt to square the ball to Lawrence Shankland, who was unmarked in the centre of the box, was cut out by Frederic Frans. 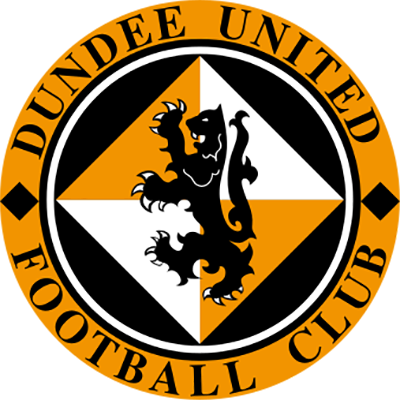 The same player was denied again a few minutes later after his shot was charged down by Paul Watson, before the crossbar came to Dundee United’s aid. Michael Moffat broke towards the Dundee United penalty area and slid the ball through to McDaid, who cut inside and smashed a shot off the underside of the bar. Callum Booth was able to hack the ball clear. Declan McDaid finally got his goal after 73 minutes. Jamie Adams hit a long free kick forwards which caused chaos in the Dundee United defence. The ball eventually broke to the Ayr right hand side where Andy Murdoch got to the ball just before Rachid Bouhenna, then chipped a ball over to the back post where McDaid hit a first time shot past Ben Siegrist to double Ayr United’s lead. Laurie Ellis responded by bringing on Nicky Clark and Sam Stanton for Matty Smith and Fraser Fyvie in an attempt to rescue the game. 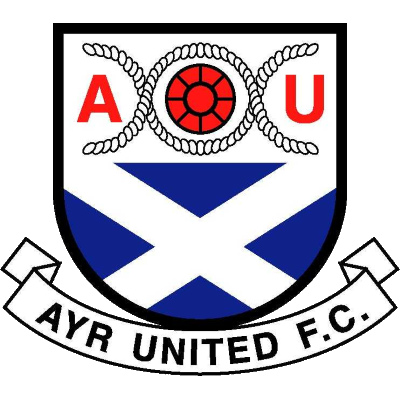 The changes could not bring the away side back into the game, and although fellow substitute Yannick Loemba did crash a shot off the bar with ten minutes to go, and Paul McMullan blasted a shot over the bar five minutes from time, Ayr United were able to see the game out comfortably, albeit without ever looking like grabbing a goal themselves. The defeat saw Dundee United fall eight points behind Ayr United, who continued to lead the Scottish Championship. 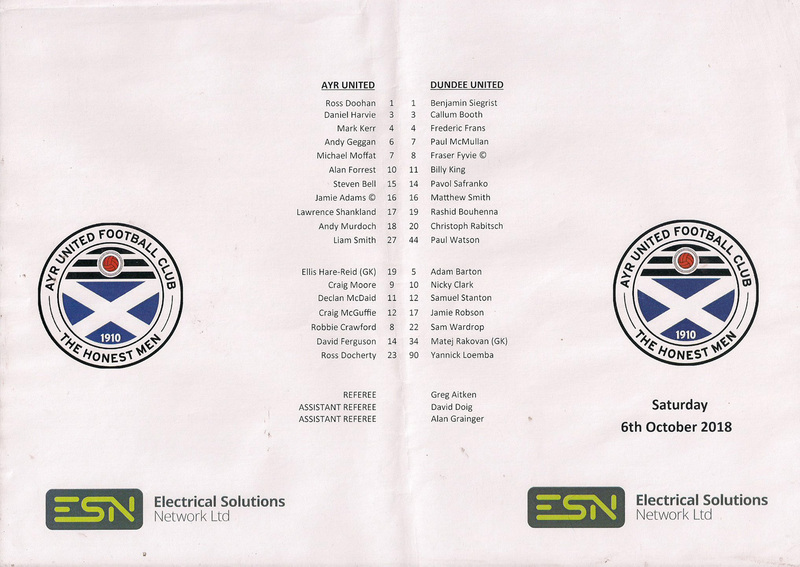 In the end, this was to be the only game of Laurie Ellis’ second caretaker spell in charge of Dundee United, as former United defender Robbie Neilson was appointed as Head Coach a couple of days after the game.